The Spark Digital certainly looks great, but it also has the sonic integrity to make it a serious home or mobile recording choice. There's no XLR output - Blue has plenty of other mics that do - but for Apple iOS devices especially, this mic comes highly recommended. Simple to use. Good sound. Good recording tips in the manual. No analogue XLR output option. 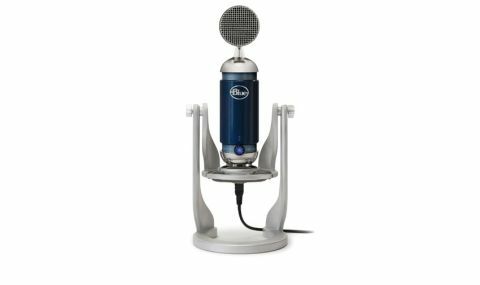 The Blue Spark Digital cardioid-pattern condenser mic is evolved from Blue's regular (analogue) Spark model, but with a digital-only output: USB to computers, or 30-pin plug to Apple iPhones and iPads. The included cables also have a separate headphone socket, which enables you to monitor what you're recording direct from the mic - a sonic improvement over iOS headphone jacks according to Blue - and with zero latency. There's a smart stand/ shockmount included, too. "Whether it's a Mac, PC or iOS device, you just plug in and go, with no need for drivers"
Whether it's a Mac, PC or iOS device, you just plug in and go, with no need for drivers. The LEDs are blue by default, meaning that the rotary knob is controlling your headphone volume. Pushing the knob in for three seconds turns the LEDs orange, whereupon you're changing the mic gain. We tried acoustic guitar, vocals, speech and a guitar amp and found the gain range (and 128dB SPL capability) appropriate for all. The onboard Focus control gives you a slightly different response, most noticeable in the low-end. Vocals and guitars sit more prominently in a mix with it on (low frequencies are rolled off around 100Hz), while the off position instead has a little kick at 90Hz. Background noise is impressively low, while the mic's neutral tonality means it's well suited as an all-rounder.